Chief Radarman (RDC) John R. Poole, suffering from kidney stones, forced brief, partial broaching, exposing only Triton's sail while remaining functionally submerged. Operation Sandblast was the code name for the first submerged circumnavigation of the world, executed by the United States Navy nuclear-powered radar picket submarine USS Triton (SSRN-586) in 1960 under the command of Captain Edward L. Beach. The New York Times described Triton's submerged circumnavigation of the Earth as "a triumph of human prowess and engineering skill, a feat which the United States Navy can rank as one of its bright victories in man's ultimate conquest of the seas." The circumnavigation took place between 24 February and 25 April 1960, covering 26,723 nautical miles (49,491 km; 30,752 mi) over 60 days and 21 hours. The route began and ended at the St. Peter and Paul Rocks in the middle of the Atlantic Ocean near the Equator. During the voyage, Triton crossed the Equator four times while maintaining an average speed of 18 knots (33 km/h; 21 mph). Triton's overall navigational track during Operation Sandblast generally followed that of the first circumnavigation of the world, led by Portuguese explorer Ferdinand Magellan from 1519 to 1522. The initial impetus for Operation Sandblast was to increase American technological and scientific prestige before the May 1960 Paris Summit between U.S. President Dwight D. Eisenhower and Soviet Premier Nikita Khrushchev. It also provided a high-profile public demonstration of the capability of U.S. Navy nuclear-powered submarines to carry out long-range submerged operations independent of external support and undetected by hostile forces, presaging the initial deployment of the U.S. Navy's Polaris ballistic missile submarines later in 1960. Finally, Operation Sandblast gathered extensive oceanographic, hydrographic, gravimetric, geophysical, and psychological data during Triton's circumnavigation. Although official celebrations for Operation Sandblast were cancelled following the diplomatic furor arising from the shooting down of a CIA U-2 spy plane over the Soviet Union in early May 1960, Triton did receive the Presidential Unit Citation with a special clasp in the form of a golden replica of the globe in recognition of the successful completion of its mission, and Captain Beach received the Legion of Merit for his role as Triton's commanding officer. In 1961, Beach received the Magellanic Premium, the United States' oldest and most prestigious scientific award, from the American Philosophical Society in "recognition of his navigation of the U.S. submarine Triton around the globe." There is no doubt that sooner or later the USSR will put some nuclear submarine to sea. It would be a shame if we permit them to announce this to the world by virtue of some dramatic feat which we could have done ourselves. This could be Sputnik all over again, but without any excuses... "Project Magellan" is, in my estimation, head and shoulders above any of the remainder as a feat of submarine navigation and a demonstration of the global range of nuclear submarines. The possibility of a submerged circumnavigation of the world by a U.S. Navy nuclear-powered submarine was initially discussed between Captain Evan P. Aurand, President Eisenhower's naval aide, and Commander William R. Anderson, commanding officer of the first nuclear submarine, Nautilus, before it was decided to attempt a submerged voyage under the North Pole. Captain Aurand is credited with recommending that a successful submerged circumnavigation, timed to conclude just prior to the upcoming May 1960 Four Power Paris Summit between U.S. President Dwight D. Eisenhower and Soviet Premier Nikita Khrushchev, would provide a much needed boost to American prestige, and consequently this voyage, code-named Operation Sandblast, reflected the highest priority within the Eisenhower administration. Captain Aurand outlined this proposed submerged around the world voyage, Project Magellan, to Admiral Arleigh Burke, the Chief of Naval Operations, in a memorandum dated 6 January 1960. Admiral Burke's classified response dated 18 January 1960 acknowledged the technical feasibility of Project Magellan while further noting that the "Magellan route" could be transited in "56 days at 20 knots (37 km/h; 23 mph) and 75 days at 15 knots (28 km/h; 17 mph)," with the latter option costing an additional $3.34 million USD in nuclear fuel consumed. Aurand forwarded his Project Magellan proposal and Burke's assessment to Press Secretary James C. Hagerty in a memorandum dated 26 January 1960. Project Magellan was subsequently approved by President Dwight D. Eisenhower, and USS Triton was specifically recommended by Aurand to undertake Project Magellan. The U.S. Navy nuclear-powered radar picket submarine Triton (pictured) was the largest, most powerful, and most expensive submarine ever built at the time of her commissioning, costing $109,000,000 excluding the cost of her nuclear fuel and reactors. A unique submarine, she also had the distinction of being the only non-Soviet submarine to be powered by two nuclear reactors. Triton's high speed was derived from her twin-reactor nuclear propulsion plant, with a designed speed, surfaced and submerged, of 28 kn (32 mph; 52 km/h). On 27 September 1959, Triton achieved "well in excess of" 30 kn (35 mph; 56 km/h) during her initial sea trials. As originally designed, Triton's total reactor output was rated at 34,000 horsepower (25,000 kW), but she achieved 45,000 horsepower (34,000 kW) during her sea trials (pictured), and her first commanding officer believed Triton's plant could have reached 60,000 horsepower (45,000 kW) "had that been necessary." As I was reporting to the Triton, I remember saying, "This ship is an unusual one. We've got to do something special with it. What could it be?" We talked about it a little bit, and nobody had any ideas. Finally, I got an idea. We'll do a stunt. We'll go around the world from North Pole to South Pole. That was my brainstorm. If you take a look at a map of the world, you'll see that's not a very easy way to go. So we didn't do that. But I do remember thinking of it. And I made a speech to the crew, advising them of my thinking—that we were going to put this ship on the map. Well, that died out. Suddenly ... a phone call came, asking me if I could be in Washington tomorrow. Following her commissioning on 10 November 1959, Triton was assigned to Submarine Squadron 10 (Subron 10), the U.S. Navy's first all-nuclear force, based at the U.S. Submarine Base in New London, Connecticut, under the command of Commodore Thomas H. Henry. Triton subsequently completed torpedo trials at Naval Station Newport and conducted other special tests at the Norfolk Navy Base before returning to Electric Boat on 7 December 1959 in order to install special communications equipment, including a prototype of the BRA-3 towed communications buoy system housed in a large fairing located on the after end of the main deck. Work on Triton at Electric Boat was delayed as priority was given to completing the Navy's first two fleet ballistic missile (FBM) submarines, George Washington and Patrick Henry. On 20 January 1960, Triton got underway to conduct an accelerated series of at-sea testing. Triton returned on 1 February as preparations continued for her forthcoming shakedown cruise, scheduled for departure on 16 February 1960, which involved operating with the command ship Northampton, flagship of the U.S. Second Fleet, in northern European waters. On 1 February, Captain Beach received a message from Rear Admiral Lawrence R. Daspit, Commander Submarines Atlantic Fleet (COMSUBLANT), instructing Beach to attend a top secret meeting at The Pentagon on 4 February. For purposes of geophysical and oceanographic research and to determine habitability, endurance and psychological stress – all extremely important to the Polaris program – it had been decided that a rapid round-the-world trip, touching the areas of interest, should be conducted. Maximum stability of the observing platform and unbroken continuity around the world were important. Additionally, for reasons of the national interest it had been decided that the voyage should be made entirely submerged undetected by our own or other forces and completed as soon as possible. TRITON, because of her size, speed and extra dependability of her two-reactor plant, had been chosen for the mission. According to Captain Beach, the Navy came up with the code name of Sandblast because it was judged that taking his ship around the world submerged would "take a lot of sand" on the crew's part to be successful. Also, Sand served as Beach's personal code name during the mission. As the captain noted: "Most beaches are full of sand, I was informed." Beach and Henry arrived back in New London at 5:45 a.m. on 5 February. Later that morning, after breakfast, Beach briefed his officers, whom Beach had insisted needed to know, about their new shakedown orders and the mission objectives for Operation Sandblast. The officers and crew of Triton had just 12 days to complete preparations for their much more ambitious, but top secret, shakedown cruise. With the exception of Chief Quartermaster (QMC) William J. Marshall, the enlisted personnel did not initially know the true nature of their upcoming mission. A cover story was devised that, following the shakedown cruise, Triton would proceed to the Caribbean Sea to undergo additional testing required by BuShips. The crew and civilian personnel were also instructed to file their federal income taxes early and take care of all other personal finances that might arise through mid-May. Lt. Commander Will M. Adams, Triton's executive officer, and Lt. Commander Robert W. Bulmer, her operations officer, along with Chief Quartermaster Marshall, prepared the precise, mile-by-mile track of their upcoming voyage in the secure chart room, located at COMSUBLANT headquarters. Lt. Commander Robert D. Fisher, Triton's supply officer, coordinated loading of stores sufficient for a 120-day voyage (pictured). Eventually, some 77,613 lb (35,205 kg) of food were loaded on board, including 16,487 lb (7,478 kg) of frozen food, 6,631 lb (3,008 kg) of canned meat, 1,300 lb (590 kg) of coffee, and 1,285 lb (583 kg) of potatoes. Vice Admiral Hyman G. Rickover, the head of the U.S. Navy's Naval Reactors branch, sent special power-setting instructions for Triton's reactors, allowing them to operate with greater flexibility and a higher safety factor. A key personnel change occurred on 2 February when Triton's veteran chief engineering officer, Lt. Commander Leslie D. Kelly, left for duty at the Rickover's Naval Reactors branch of the U.S. Atomic Energy Commission. His relief was his former assistant engineering officer, Lt. Commander Donald G. Fears. Also, a number of supercargo personnel joined Triton for her shakedown cruise, with none aware of the top-secret nature of Operation Sandblast. Joseph Baynor Roberts was a well-known photographer from the National Geographic Magazine, and as a Commander in the U.S. Naval Reserve, he was recalled to active duty to serve as the press pool for the voyage with the U.S. Navy Office of Information. Additionally, Roberts and First Class Photographer's Mate (PH1) William R. Hadley, USN, detached from Naval Air Force U.S. Atlantic Fleet, coordinated the photo-reconnaissance aspects of Operation Sandblast. The other civilian personnel included Dr. Benjamin B. Weybrew, a psychologist at U.S Naval Submarine Medical Research Laboratory, would carry out a battery of psychological studies with volunteers from the crew. Geophysicist Michael Smalet, civil engineer Gordon E. Wilkes, and oceanographer Nicholas R. Mabry coordinated the various scientific and technical aspects of Operation Sandblast for the U.S. Navy's Hydrographic Office. Eldon C. Good monitored the Ship Inertial Navigation System (SINS) prototype, newly installed onboard Triton by the Sperry Gyroscopic Company. Frank E. McConnell was the Electric Boat guaranty representative assigned to Triton's shakedown cruise. On 15 February 1960, Triton went to sea to do a final check of all shipboard equipment. Except for a malfunctioning wave-motion sensor, Triton was deemed ready for her shakedown cruise. The sea may yet hold the key to the salvation of man and his civilization. That the world may better understand this, the Navy directed a submerged retrace of Ferdinand Magellan's historic circumnavigation. The honor of doing it fell to the Triton, but it has been a national accomplishment; for the sinews and the power which make up our ship, the genius which designed her, the thousands and hundreds of thousands who labored, each at his own metier, in all parts of the country, to build her safe, strong, self-reliant, are America. Triton, a unit of their Navy, pridefully and respectfully dedicates this voyage to the people of the United States. Triton departed New London on 16 February 1960 for what was announced as her shakedown cruise (pictured). Triton set course to the south-east (134 degrees true). At dawn on 17 February, Triton performed her first morning star-sighting using the built-in sextant in her No. 1 periscope during the nightly ventilation of the shipboard atmosphere. The inboard induction valve was closed after the removal of a rusted flashlight that had prevented its closure. Men, I know you’ve all been waiting to learn what this cruise is about, and why we’re still headed southeast. Now, at last, I can tell you that we are going on the voyage which all submariners have dreamed of ever since they possessed the means of doing so. We have the ship and we have the crew. We’re going around the world, nonstop. And we’re going to do it entirely submerged. Early on, I realized that what this particular crew needed from me was not pressure but the light touch. Once informed of our objective, their enthusiasm infected everything they did, and here and there might easily have caused stress-related dysfunction. Extended separation from home and family with no means of communications was not a problem — submariners are used to that — but bearing down too much on the job might be. My concern was about our performance in an emergency, being at the same time unable to predict what emergencies might be in store for us. It was important, I thought, to hold back on the pressure until a really tough problem came up. This happened several times, as I knew it would, and I was glad I had something in reserve. For the shakedown cruise, Beach adopted a specific weekly shipboard routine. Mondays and Tuesdays involved regular activities, with drills, lectures, school of the ship, and class programs from the noon to 1600 watch. Wednesdays had the crew on reduced activities that is traditionally known as Rope Yarn Sunday. Thursdays saw a schedule of regular drills, and Fridays involved upkeep and general maintenance activities known as Field Day. Saturdays had regular activities with afternoon drills, and Sundays had reduced activities with normal watches and religious observances. Also, beginning on 17 February during the mid watch, Triton came to periscope depth to take a nightly fix using the built-in sextant in her celestial periscope, ventilate and replenish her shipboard atmosphere using the snorkel, and dispose of any shipboard garbage. Since Triton did not have a generator to extract oxygen from sea water, these nightly snorkeling activities were crucial to maintaining a suitable atmosphere. Later that same day, 17 February 1960, Triton experienced a serious leak with a main condenser circulating water pump, and a reactor warning alarm tripped because of a defective electrical connection. Both incidents were handled successfully and did not affect the ship's performance. On 18 February Triton conducted her first general daily drill and on 19 February released her first twice-daily hydrographic bottles, used to study ocean current patterns. Also on 19 February, shipboard sensors detected a radiation leak. It was subsequently determined the radium dials on three wristwatches were the cause for the alarm, and once removed, no radiation was detected for the balance of the voyage. On 23 February, Triton detected a previously uncharted seamount with her fathometer. Beach maintained that the greatest challenge facing the crew was a seemingly mundane activity, garbage disposal and cleaning: "It was 84 days of strenuous work just keeping the ship clean. It was amazing how much dirt we created, so I had a field day every weekend. The crew started objecting until they saw how much trash we kept getting rid of. Then they couldn't object." To remove trash without surfacing, Triton had a garbage disposal unit (GDU), a small inverted torpedo tube that ejected a weighted bag of refuse through the bottom of the ship. However, if the GDU was temporarily out of commission due to repairs, as it was on 22 February, the after torpedo tubes were used, a less than optimum solution. On 24 February, Triton made her first landfall, reaching St. Peter and Paul Rocks (pictured) after traveling 3,250 nautical miles (6,020 km; 3,740 mi). The Rocks served as the home plate for Triton's submerged circumnavigation. Photographic reconnaissance was carried out by Lt. Richard M. Harris, the CIC/ECM officer, and Chief Cryptologic Technician (CTC) William R. Hadley, who served as the ship's secondary photo-recon team for the voyage. Triton turned south and crossed the equator for the first time later that day, passing into the Southern Hemisphere, with ship's personnel participating in the crossing the line ceremony (pictured). Fortunately at the present time we are in an area where the water is deeper than normal for the Atlantic and for a number of hours there is [no] worry about unexpectedly scraping the top of any unsuspected submerged peak. But we will want that fathometer badly as we approach Cape Horn. Perhaps most critically, the third problem involved the readings on one of the reactors indicating a serious malfunction which required its shutdown. [Note 1] As Captain Beach noted, "So far as Triton and the first of March were concerned, it seemed that troubles were not confined to pairs. On that day we were to have them in threes." Later that day, Lt. Milton R. Rubb and his electronics technician team returned the fathometer to operational status, and the Chief Engineer Donald D. Fears, Reactor Officer Lt. Cmdr. Robert P. McDonald, and Triton's engineering crew repaired the malfunctioning reactor. Since Poole's symptoms were intermittent, Triton continued south, although there was a detour to the Golfo Nuevo region when the ship investigated an unknown sonar contact. Contemporary news accounts reported the Argentine Navy had been encountering numerous unknown submarine contacts in the Golfo Nuevo during early 1960, but Triton's contact turned out to be a school of fish. In the control and living spaces, the ship had quieted down, too. Orders were given in low voices; the men speak to each other, carrying out their normal duties, in a repressed atmosphere. A regular pall has descended upon us. I know that all hands are aware of the decision and recognize the need for it. Perhaps they are relieved that they did not have to make it. But it is apparent that this unexpected illness, something that could neither have been foreseen nor prevented, may ruin our submergence record. Fortunately, the heavy cruiser Macon, with Captain Reuben T. Whitaker in command, had been on a good-will cruise to South American ports since January as the flagship for Rear Admiral Edward C. Stephan, Commander Naval Forces South Atlantic (Task Force 138). Macon had been in Argentine waters in conjunction with US President Eisenhower's visit to Argentina from 26–29 February 1960. In the early hours of 5 March, Triton rendezvoused with Macon off Montevideo, Uruguay, after a diversion of over 2,000 nautical miles (3,700 km; 2,300 mi). Triton broached, exposing only her sail while preserving the submarine's submerged status. A boat-handling party led by Lieutenant George A. Sawyer, the ship's gunnery officer, transferred Poole to the waiting whaleboat, which then returned to Macon. Poole was the only crew member who did not complete the voyage. Chief Radarman Poole was subsequently examined by both the doctors aboard Macon and at a hospital in Montevideo, but his third attack of kidney stones, which prompted his transfer off Triton, proved to be his last–and he did not require kidney surgery. After the rendezvous, Triton dove and turned back southwards. She subsequently passed west of the Falklands, and rounded Cape Horn (pictured) through Estrecho de le Maire (Drake Passage) on 7 March. Captain Beach described his first impressions of this legendary lands-end of the Western Hemisphere as "bold and forbidding, like the sway-backed profile of some prehistoric sea monster." Captain Beach allowed all the crew an opportunity to view Cape Horn through the ship's periscope, requiring five reverses of Triton's course to keep the cape in sight. On 7 March, Triton entered the Pacific Ocean and passed into the operational control of Rear Admiral Roy S. Benson, Commander Submarine Force U.S. Pacific Fleet (COMSUBPAC), who had been Captain Beach's commanding officer while he served on the fleet submarine Trigger (SS-237) in the Pacific War. Triton's first Pacific visual landfall was Easter Island, some 2,500 nautical miles (4,600 km; 2,900 mi) away. On 8 March, Triton detected a seamount, registering a minimum depth of 350 fathoms (640 m; 2,100 ft), with a total height of 7,000 feet (2,100 m) above the ocean floor. Also on that day, Triton successfully conducted a drill simulating the emergency shutdown of both her reactors and loss of all power. Two days later, the starboard propshaft seal sprung a major leak in the after engine room. [Note 2] A makeshift locking clamp was jury-rigged to contain the leak. On 12 March, the trouble-plagued fathometer ceased operation when its transducer header flooded, grounding out the entire system. Since the transducer head was located outside the boat's pressure hull, it could not be repaired except in drydock. Without an operational fathometer, Triton could be vulnerable to grounding or collision with uncharted submerged formations. It was subsequently determined that the cabling to Triton's fathometer head, located in the bulbous forefoot of her bow, had not been properly insulated, and the constant buffeting from Triton's high speed caused these cables to rupture, rendering the fathometer inoperable. An alternative to the fathometer was devised involving the use of the ship's active forward search sonar in conjunction with the gravity meter installed in the combat intelligence center (CIC). By using both systems in tandem, underwater masses could be detected and avoided, although this approach lacked the capability of the fathometer to echo-sound the depth of the ocean floor. On 13 March, Triton detected a submerged peak using active sonar and the gravity meter that confirmed the feasibility of this procedure. Triton next spotted Easter Island on that same day, 13 March 1960, first by radar, then by periscope. The northeastern coast of the island was photographed for two and a half hours before the statue that Thor Heyerdahl had erected was spotted. The entire crew was invited to observe through the periscope before Triton departed for her next visual landfall–Guam, some 6,734 nautical miles (12,471 km; 7,749 mi) distant. A malfunctioning air compressor was repaired on 17 March. The repair required the complete re-wiring of the compressor's armature, a task ordinarily done aboard a submarine tender or in a shipyard. Captain Beach was deeply impressed by "this spirit and outlook [that] permeated our crew." He was also "astonished" by two different makeshift fathometer sound transmitters created by the electronics and engineering crewmen. One was based on a general announcing speaker, while the other used a stainless steel cooking pot from the galley, with stainless steel rods and copper wiring. Beach noted in the ship's log: "I could only marvel at the ingenuity of the American sailor." On 19 March, Triton detected another submerged peak, using its sonar and gravity meter, and crossed the equator a second time–passing into the Northern Hemisphere again. Another submerged peak was successfully detected on 20 March. Later that day, Triton made her closest approach to Pearl Harbor, and the crew celebrated with a luau. Triton crossed the International Date Line on 23 March, losing 24 March from her calendar. The next day, sonar indicated another rise from the ocean floor, previously uncharted, logged with a depth of 350 fathoms (640 m; 2,100 ft). Two days later, 27 March, Triton passed the point of closest approach to the location where her namesake was lost during World War II, and a memorial service was held to commemorate the occasion. A submerged naval gun salute was fired to honor the lost crew when three water slugs were shot in quick succession from the forward torpedo tubes. On the morning of 28 March, Triton spotted Guam and observed activity on shore via her periscope. Petty Officer Edward Carbullido (pictured), who had been born on Guam but had not returned home for 14 years, was asked to identify his parents' house through the periscope while the boat remained submerged in Agat Bay. Triton then changed course for the Philippines, the midpoint of her around-the-world voyage. Carbullido was subsequently able to go home to Guam for Christmas Day 1960 on a 60-day leave, with the cost of his flight paid for by selling a magazine article on Triton's circumnavigation written by Captain Beach, and with the assistance of Pan American Airways. Captain Beach subsequently wrote an account of Carbullido's visit for the November 1961 issue of The American Legion Magazine. On 31 March, Triton crossed over the Philippine Trench and began threading her way through the vast Philippine archipelago, passing from the Philippine Sea through the Surigao Strait and then the Mindanao Sea, and finally through the Bohol Strait into the Camotes Sea. The memorial shrine of Ferdinand Magellan in Mactan Island, Cebu. A special water sample was taken during Triton's transit of Surigao Strait; its recipient was the retired Vice Admiral Jesse B. Oldendorf, the task force commander whose battleships had defeated the Japanese Southern Force during the Battle of Surigao Strait, history's last naval action fought between battleships, during World War II. Captain Beach observed, "We think that Admiral Oldendorf will appreciate a sample of this body of water." On 1 April, Triton spotted Mactan Island, and shortly before noon, sighted the monument (pictured) commemorating the death of Ferdinand Magellan at that site, thereby reaching the midpoint of her circumnavigation. Ordinarily a leader given to the most meticulous preparations for any important undertaking, one who personally checked every item and left no stone unturned in his effort to eliminate any possible cause of failure, Magellan's every action during this entire episode ... might almost have been calculated with the intention of seeking defeat. Such was the height of his religious fervor that divine intervention was expected as a matter of course. God, having brought him this far, would not forsake him now. So much have thought Magellan in the height of his exaltation, forgetting entirely that God is not bound by the conventions of man's thought. It is a ludicrous situation: On one hand an impassive Asian, staring with curious concentration at an unusual object in the water; on the other, a U.S. Navy officer, equipped with all technical devices money and science can procure, looking back with equally studied concentration. On one end of the periscope, an outrigger canoe propelled by the brawny arms of its builder; on the other end, a $100,000,000 submarine, the newest, biggest, most powerful in the world, on a history-making voyage. What an abyss — what centuries of scientific development — lie between me and him! The noted photographer Joseph Baynor Roberts of National Geographic magazine was able to snap several photos of this unexpected interloper (pictured) through the ship's periscope before Triton moved out of range. The November 1960 issue identified the fisherman as 19-year-old Rufino Baring of Punta Engano, Mactan Island, who believed he had encountered a sea monster: "I was very frightened. I tried to get away as fast as I could." Later on the afternoon of 1 April, Triton proceeded through Hilutangan Channel into the Sulu Sea via Bohol Strait. On 2 April, Triton's gyroscopic repeaters, used to maintain the ship's navigational bearing, began to experience sudden, severe oscillations, possibly caused by a malfunctioning synchro amplifier. The helm was shifted to direct gyro input, the synchro amplifiers were checked out, and the gyroscopic repeaters appeared to return to normal function. Later, while transiting the Pearl Bank Passage, a narrow channel lined with coral reefs, a periscope observation determined that Triton was off course, indicating a potentially hazardous helm error. Steering control was immediately shifted to the control room, with the helm using the master gyroscopic repeater. While the malfunction was detected in time and the ship was not in any immediate danger, the loss of navigational bearing could have been catastrophic, with Captain Beach noting that "the episode had a sobering effect." Triton then proceeded through the Sibutu Passage into the Celebes Sea, leaving Philippine waters, and subsequently entered Makassar Strait, crossing the equator a third time, on 3 April, and then, during 4 April, transited the Flores Sea, bound for Lombok Strait, the gateway to the Indian Ocean. On 5 April, Triton entered the Indian Ocean via the Lombok Strait. The transition proved dramatic. The change in salinity and density of the seawater caused her to dive abruptly from periscope depth to 125 feet (38 m) in about 40 seconds. Captain Beach noted, "I had experienced changes in water density many times before, but never one of this magnitude." Triton returned to periscope depth and subsequently entered the Indian Ocean. While crossing the Indian Ocean, Triton conducted a sealed-ship experiment. Beginning 10 April, rather than refreshing the air in the ship by snorkeling each night, she remained sealed, using compressed air to make up for consumed oxygen, as well as burning "oxygen candles" to replenish the ship's atmosphere. Also, starting on 15 April, the smoking lamp was extinguished, with no tobacco smoking permitted anywhere aboard the ship. During this smoking ban, Dr. Benjamin Weybrew carried out a battery of tests on crew volunteers, both smokers and non-smokers, to measure cardiovascular functions and psychological stress indices to determine the effects that the prohibition of tobacco had on individual and group performance of the test subjects. The objective of this experiment was to determine the advisability of prohibiting the use of tobacco from submarine operations given the extended submerged duration of missions involving nuclear-powered submarines. The test results determined that smokers showed consistently higher mean oral temperature and pulse rate, both at rest and following exercises, as well as significantly increased pulse rates over non-smokers, a marked decrease in alertness, and an increase in insomnia symptoms. However, there was no significant difference in blood pressure between smokers and non-smokers. Finally, smokers experienced "debilitative performance decrements" during the smoking prohibition, and as a consequence, this also affected the morale of non-smokers, both among the participants in the experiment as well as non-participants. Dr. Weybrew concluded smoking should be avoided because of its attendant health and relational issues, and not smoking enhances one's overall stress coping capacity (SCC). At the 1963 convention of the Cigar Institute of America, Weybrew noted: "When a smoker is forbidden to smoke he just doesn't like it. The smokers in the test got irritable, ate too much, had trouble sleeping, and personal relationships began to deteriorate." On Easter Sunday, 17 April, Triton sighted the Cape of Good Hope and subsequently re-entered the South Atlantic Ocean, returning to the command authority of Rear Admiral Lawrence R. Daspit (COMSUBLANT). The smoking lamp was re-lit on 18 April, with the three days of prohibition having taken a noticeable toll on crew morale. Rather than passing the word in a traditional manner, Captain Beach demonstrated the lifting of the ban by walking through the ship smoking a cigar, blowing smoke in people's faces, and asking, "Don't you wish you could do this?" He recorded in his log that "it took some 37 seconds for the word to get around." On 20 April 1960, Triton crossed the Prime Meridian, and on 24 April, the sealed atmosphere experiment was terminated. On the same day that the sealed atmosphere experiment was terminated, 24 April 1960, Triton experienced a major equipment failure. In the after torpedo room, a hydraulic line to the stern plane mechanism burst. Through the prompt action by Torpedoman's Mate Third Class Allen W. Steele, aided by Engineman Third Class Arlan F. Martin, this potentially catastrophic event was successfully contained. Eventually, the main hydraulic system was restored with a control valve from the steering system, but the boat's steering controls remained on emergency mode for the rest of the voyage. It was subsequently determined that the pipe burst was caused by a fractured valve. For his quick and decisive actions in handling this emergency, Steele was presented the Navy Commendation Medal. On 25 April, Triton crossed the Equator a final time, re-entering the Northern Hemisphere, and shortly thereafter, she sighted the St. Peter and Paul Rocks, completing the first submerged circumnavigation. As Captain Beach wrote, "We are not yet home, but we may be considered to have taken a long lead off third base." During 28–29 April, Triton conducted engineering drills, then proceeded to Tenerife, the Canary Islands, arriving on 30 April, and thereafter setting course for Cadiz, Spain, to complete two additional goals of Operation Sandblast. One was to honor the seaport where Ferdinand Magellan set sail from in 1519 to initiate the first global maritime circumnavigation, and the other was to deliver a plaque created to honor Magellan's and Triton's historic voyages when Triton rendezvoused with the destroyer John W. Weeks off Cadiz on 2 May 1960. Afterward, Beach noted, "We are on the last leg of our trip enroute to the United States." Triton returned to the United States, surfacing off the coast of Rehoboth Beach, Delaware, on 10 May 1960. Captain Beach was flown by helicopter (pictured) to Washington, D.C., where news of Triton's submerged around-the-world voyage was announced by President Dwight D. Eisenhower at the White House, with Vice Admiral Hyman G. Rickover, known as the "Father of the Nuclear Navy", in attendance. Beach flew back to his boat later that day, and Triton arrived back at Groton, Connecticut, on 11 May 1960, completing her shakedown cruise and the first submarine circumnavigation of the earth. Triton's globe-girdling cruise proved invaluable to the United States. Politically, it enhanced the nation's prestige. From an operational viewpoint, the cruise demonstrated the great submerged endurance and sustained high-speed transit capabilities of the first generation of nuclear-powered submarines. Moreover, during the voyage, the submarine collected reams of oceanographic data. On her shakedown cruise, Triton was submerged a total of 83 days 9 hours, covering 35,979.1 nautical miles (66,633.3 km; 41,404.0 mi). The total duration of the shakedown cruise was 84 days 19 hours 8 minutes, covering 36,335.1 nautical miles (67,292.6 km; 41,813.7 mi). The Cable & Wireless Adventurer did not beat Triton's record if it took them 75 days to circumnavigate the earth. And if their route was 4752 statute miles (7647.6 km) shorter than ours, they simply aren't even close." When Tully made inquiries regarding inconsistencies pertaining to the fastest motorized maritime circumnavition record, the Guinness World Records response was: "If the US Department of Defense would care to present us with all the facts, we'll look at it again." Tully noted that this information had been publicly available since the publication of Around the World Submerged: The Voyage of the Triton, Captain Beach's 1962 account of Operation Sandblast. Arguably, Triton's circumnavigation remains the fastest for a motorized sea vessel, beating Cable & Wireless Adventurer's 1998 74-day voyage and Earthrace's 2008 circumnavigation of 60 days, 23 hours, and 49 minutes. Operation Sandblast gathered extensive oceanographic, hydrographic, gravimetric, and geophysical data. Water samples were taken throughout Triton's circumnavigation, which were tested for differences in chemical composition, salinity, density, and temperature. Such samples were vital for submarine operations. Water salinity and density affects submerged trim, as well as sonar performance, while warmer water affects the efficiency of shipboard condensers and, consequently, ship speed. Measurements from the installed gravity meter provided a continuous record of variations in earth's gravity field throughout Triton's circumnavigation. This extensive gravity study assisted the Navy in developing navigational aids. Some 144 hydrographic bottles to track ocean currents were released during Operation Sandblast. Triton mapped uncharted seamounts, coral reefs, and other submerged topographic structures using its fathometer and sonar systems. These scientific data gathered during Operation Sandblast continued to be invaluable in providing information on oceanic changes, with Sydney Levitus, the director of NOAA's Ocean Climate Laboratory in Silver Spring, Maryland, characterizing Triton's data (pictured) as being "a very exciting set of observations." Operation Sandblast also proved nuclear-powered submarines could undertake extended operations independent of any external support. Specifically, Triton tested a prototype ship inertial navigational system (SINS) for submarine use, as well as being the first submarine to test the floating very low frequency (VLF) communications buoy system, with both systems being vital for the Navy's upcoming Polaris fleet ballistic missile submarines (FBM) deterrence patrols. Finally, the psychological testing of Triton's crew members to determine the effects of long-term isolation was particularly relevant for the initial deployment of the Navy's fleet ballistic missile submarines, as well as NASA's upcoming manned space program, Project Mercury, with MIT engineers assuring NASA "that getting to the moon and back was simpler than guiding an antiballistic missile or circumnavigating the earth under water in a nuclear submarine." Although the voyage had been conceived as a way for Eisenhower to impress Soviet General Secretary Nikita Khrushchev at the Paris summit, this conference was canceled after U-2 pilot Francis Gary Powers was shot down over the Soviet Union on May 1. But coming less than two years after the transpolar expedition of the USS Nautilus, the Triton's accomplishment was a clear reaffirmation of U.S. technological supremacy. The first underwater circumnavigation of the globe is a triumph of human prowess and engineering skill, a feat which the United States Navy can rank as one of its bright victories in man's ultimate conquest of the seas. Presidential Unit Citation including the special clasp in the form of a golden replica of the globe of the world. Because of the public uproar over the U-2 Incident, which sparked a major Soviet-American diplomatic crisis that led to the collapse of the 1960 Paris Summit, most of the official celebrations for Triton's submerged circumnavigation were canceled. The voyage did receive extensive contemporary coverage by the news media, including feature magazine articles by Argosy, Life, Look, National Geographic, and the Saturday Evening Post as well as television and newsreels. Triton's commanding officer during Operation Sandblast, Captain Edward L. Beach, appeared on CBS news program Face the Nation on 15 May 1960 while several Triton crew members appeared on the What's My Line television game show. Triton's submerged circumnavigation was the subject of the ABC television series Expedition! broadcast on Tuesday, 14 February 1961. Hosted by John D. Craig, this episode was titled Saga of the Triton, and it featured film footage from Operation Sandblast with voice-over narration extracted from Captain Beach's logbook. The American government published an 82-page redacted version of Triton's log (pictured) following the submerged circumnavigation. It was described by the New York Times as "a literary product in its own right [that] rivals in spots the suspense and drama of an adventure from the pages of Captain Hornblower." Captain Beach wrote the lead article ("Triton Follows Magellan's Wake") on the circumnavigation for the November 1960 issue of National Geographic Magazine, and he also wrote a book-length account, Around the World Submerged: The Voyage of the Triton, which was published in 1962. Beach also made public presentations of the accomplishments of Operation Sandblast before the National Press Club (pictured), National Geographic Society on 27 May 1960, the American Philosophical Society on 22 April 1961, the Society of Non-Destructive Testing on 8 May 1965, and the Eagle-Scout Recognition Dinner in Chicago, Illinois, on 4 November 1965. Historian Bern Dibner wrote Victoria and the Triton, a 1964 book about famous maritime circumnavigations, featuring the Victoria, the Spanish carrack that was the first ship to circumnavigate the world under Ferdinand Magellan, as well as Triton's submerged circumnavigation of 1960. Also, Beril Becker wrote a 1961 juvenile-market non-fiction account of Operation Sandblast, Around the World Underwater: Captain Edward L. Beach, with illustrations by Richard Modock. Finally, the feat of successfully completing the first submerged circumnavigation of the world by the submarine Triton was recognized as a significant scientific and technological achievement for the year 1960 in Bernard Grun's authoritative historical reference, The Timestables of History. Operation Sandblast is also examined within the overall context of global circumnavigations in Joyce E. Chaplin's 2012 history Round About the Earth: Circumnavigation from Magellan to Orbit. I'm proud of Triton's around-the-world cruise, but I didn't really do that. That was done by my crew and the Navy - the ship the Navy built and put me in command of. That's not a personal achievement, although I was captain of the ship. For meritorious achievement from 16 February 1960 to 10 May 1960. During this period the TRITON circumnavigated the earth submerged, generally following the route of Magellan’s historic voyage. In addition to proving the ability of both crew and nuclear submarine to accomplish a mission which required almost three months of submergence, TRITON collected much data of scientific importance. The performance, determination and devotion to duty of the TRITON’s crew were in keeping with the highest traditions of the naval service. All members of the crew who made this voyage are authorized to wear the Presidential Unit Citation ribbon with a special clasp in the form of a golden replica of the globe. Up to that time, this was only the second time that a U.S. Navy vessel had been awarded the Presidential Unit Citation for a peacetime mission, with the nuclear submarine USS Nautilus (SSN-571) receiving the first peacetime PUC in recognition of its voyage under the North Pole (Operation Sunshine) in 1958. To commemorate the first submerged circumnavigation of the world, all Triton personnel who made that voyage were authorized to wear their Presidential Unit Citation ribbon with a special clasp in the form of a golden replica of the globe (pictured). For exceptionally meritorious conduct in the performance of outstanding service while serving on board the U.S.S. TRITON from 16 February 1960 to 10 May 1960. As Commanding Officer, Captain Edward L. Beach, United States Navy, led his crew with courage, foresight and determination in an unprecedented circumnavigation of the globe, proving man's ability under trying conditions to accomplish prolonged submerged missions as well as testing new and complex equipment in the world's largest submarine. This historic voyage took his ship into strange waters under difficult and frequently unknown conditions, as a result, the TRITON collected much valuable oceanographic information. Captain Beach's sound judgment, masterful leadership, professional skill and devotion to duty were in keeping with the highest traditions of the naval service. Your most recent exploit in commanding the largest submarine in existence during an historic submerged voyage around the globe has won for you and your crew the admiration of the world you circled. In 1961, the American Philosophical Society presented Beach with its Magellanic Premium, the nation's oldest and most prestigious scientific award, in "recognition of his navigation of the U.S. submarine Triton around the globe." In 2011, Operation Sandblast, the USS Triton, and Captain Edward L. Beach, Jr., were included in the Technology for the Nuclear Age: Nuclear Propulsion display for the Cold War exhibit at the U.S. Navy Museum in Washington, DC. On 11 April 1960, the chief petty officers Hugh M. Bennett, Jr.; Joseph H. Blair, Jr.; Harry W. Hampson; Herbert F. Hardman; and Lynn S. Loveland were announced for promotion to ensign and moved into the ward room. Also on that date, the first-class petty officers George M. Bloomingdale; Richard R. Fickel; Joseph R. Flasco; Gene R. Hoke; Lonard F. Lehman; George W. Mather; J. C. Meaders; Russell F. Pion; Gerald R. Stott; and Robert R. Tambling were promoted to Chief Petty Officers and moved in the Chiefs' Quarters. Executive Officer Will Mont Adams, Jr., received notice of his promotion to full Commander on 30 April 1960, his birthday, effective 1 February 1960. Also on that date, Chief Engineering Officer Donald Gene Fears was promoted to Lieutenant Commander, effective 1 February 1960. On 10 May 1960, William R. Hadley, Chief Communications Technician, was awarded his silver dolphin pin, signifying that he was qualified to serve on submarines. Also on that date, enlisted men Lawrence W. Beckhaus; Fred Kenst; William A. McKamey; and James H. Smith, Jr., were awarded their silver dolphin pins. The epochal achievement of the fleet of Magellan in circumnavigating the globe was echoed in the magnificent accomplishment by the nuclear submarine Triton in 1960. Like the voyage of Magellan, that of the Triton created stirring philosophical concepts. It demonstrated that a company of men could live and work in the depth of the ocean for months at a time. It was shown that thru the new technology a source of power had been made in such abundance and so manageable that, without refueling, an 8000-ton vehicle would be driven thru the water around the world. It was also shown that the arts of observation, navigation, communication and control had reached the point where travel under the water was possible with pinpoint accuracy. In the eight days prior to Triton's departure on her around-the-world submerged voyage, Captain Beach approached Lt. Tom B. Thamm, Triton's Auxiliary Division Officer, to design a commemorative plaque for their upcoming voyage, as well as the first circumnavigation led by Portuguese explorer Ferdinand Magellan. The plaque's eventual design consisted of a brass disk about 23 inches (58 cm) in diameter, bearing a sailing ship reminiscent of Magellan's carrack, Trinidad, above the submarine dolphin insignia with the years 1519 and 1960 between them, all within a laurel wreath. Outside the wreath is the motto AVE NOBILIS DUX, ITERUM FACTUM EST ("Hail Noble Captain, It Is Done Again"). Commodore Tom Henry, commanding Submarine Squadron 10, supervised the completion of the plaque. The carving of the wooden form was done by retired Chief Electrician's Mate Ernest L. Benson at New London. The actual molding of the plaque was done by the Mystic Foundry. During the homeward leg of her around-the-world voyage, Triton rendezvoused with the destroyer John W. Weeks on 2 May 1960 off Cadiz, Spain, the departure point for Magellan's earlier voyage. Triton broached, and Weeks transferred the finished plaque to Triton for transport back to the United States. The plaque was subsequently presented to the Spanish government by John Davis Lodge, the United States Ambassador to Spain. This plaque is located at the City Hall in Sanlúcar de Barrameda, Spain, and it is mounted on the wall of the city hall with a marble slab memorializing the 1960 Triton submerged circumnavigation. Duplicates of the Triton Plaque were also presented to the Mystic Seaport Museum in Mystic, Connecticut, and the Naval Historical Association in Washington, D.C., as well as the U.S. Navy Submarine School and the U.S. Navy Submarine Force Library and Museum, both located in Groton, Connecticut. Triton Light is a navigational beacon on the seawall of the United States Naval Academy (USNA) in Annapolis, Maryland, where the Severn River meets Spa Creek and the Annapolis harbor. It was donated to the Academy and named for the Greek god by the United States Naval Academy Class of 1945. The crew of Triton provided samples of water taken from the 22 seas through which their ship had passed during their submerged 1960 circumnavigation, which were used to fill a globe built into the Triton Light along with a commemorative marker. Beach Hall is the new headquarters for the United States Naval Institute which was dedicated on 21 April 1999. The facility is named after Captain Edward L. Beach, Sr., who served as the Institute's secretary-treasurer, and his son, Captain Edward L. Beach, Jr. (pictured), who commanded Triton during Operation Sandblast. Triton's dive wheel from its conning tower is on display in the lobby of Beach Hall. Triton was the 2003 inductee into the Submarine Hall of Fame in recognition of executing the first submerged circumnavigation, following her nomination by the Tidewater chapter and Hampton Roads Base of the United States Submarine Veterans, Inc. (USSVI). A shadow box filled with Triton memorabilia was placed in Alcorn Auditorium of Ramage Hall located at the U.S. Navy Submarine Learning Center, Naval Station Norfolk. The USS Triton Submarine Memorial Park is located along the Columbia River in Washington. Its purpose is "to establish a permanent park in north Richland in recognition of all the decommissioned reactor cores off-loaded at the Port’s barge slip, transported and stored at the Hanford Site." The park features Triton's sail superstructure (pictured) and eventually an information display on the history of Triton. The park also serves as a tourist attraction, especially due to its location, since Hanford is the resting place of spent reactor cores from several Navy ships. The park's tentative location is at the end of Port of Benton Boulevard in north Richland, Washington. Planning called for Triton's sail to be cut up for transport and re-assembly at the park site. Ground-breaking was initially scheduled to take place on 3 April 2008, with the dedication ceremony set for 19 August 2008 and a Fall 2009 start-date for construction. On 23 October 2009, the Port of Benton encased Triton's conning tower in concrete at its new USS Triton Submarine Memorial Park in north Richland, Washington. In mid-December 2009, the final pieces of Triton's sail were welded together at the park's site. During the 11 August 2010 Port of Benton commission meeting, it was reported that bids for the first phase, which includes the park's electrical lighting system and the pouring the concrete around Triton's sail, would be announced shortly by the port authority. The second phase would involve the park's landscaping, and the third phase would be the installation of a parking lot. The park is part of the Richland Riverfront Trail, a marked hiking trail that focuses on the state of Washington's contribution to the nuclear history of the United States, and it connects to the Sacagawea Heritage Trail. The USS Triton Submarine Memorial Park is located off George Washington Way near the Columbia River, and it was formally dedicated on November 10, 2011, the 52nd anniversary of the commissioning of the USS Triton. You know, I think the Triton kind of, I think was a spur for that routine as I think back. Because I then imagined what a trip like that would have been like with a totally incompetent commander, and the cruise of USS Codfish was the final result. Captain Beach reportedly played "The Cruise of the U.S.S. Codfish" over the ship's public address system during Triton's first overseas deployment in the Fall of 1960. Finally, Antigua-Barbuda issued a commemorative stamp of Triton's 1960 submerged circumnavigation. The 50th anniversary of Operation Sandblast and Triton's submerged circumnavigation of the world was celebrated on 10 April 2010, during the 2010 Submarine Birthday Ball held at the Foxwoods Resort Casino in Mashantuket, Connecticut, with Master Chief Petty Officer of the Navy (MCPON) Rick D. West delivering opening remarks (pictured) to the 2,200 attendees. The U.S. Navy Submarine Force Library and Museum sponsored additional events and activities, entitled "9,000 Leagues Under the Sea," between April 10–12 and April 14–18, 2010. Also, on April 9, 2010, retired Admiral Henry G. Chiles, Jr., who served in Triton from 1963 to 1966, was the keynote speaker at the graduation class of the Basic Enlisted Submarine School at the New London Naval Submarine Base in Groton, Connecticut. The graduation class was named in honor of Triton, and each graduate received a certificate of course completion and a commemorative coin celebrating the 50th anniversary of Triton's submerged circumnavigation. The Dolphin Scholarship Foundation used the 50th anniversary of Operation Sandblast to promote its Race Around the World fund-raising program to support its Dolphin Scholarship program. Finally, former members of Triton's crew received commemorative souvenirs of the ship's pressure hull at their 2010 re-union. On 25 April 2010, the University of Texas Marine Science Institute posted a radio program article on its Science and the Sea web site commemorating Operation Sandblast and the USS Triton. Writer-historian Carl LaVO wrote "Incredible Voyage" for the June 2010 edition of Naval History magazine, and John Beach wrote "The First Submerged Circumnavigation" for the April 2010 issue of The Submarine Review, the official magazine of the Naval Submarine League. Mr. Beach is the nephew of Captain Edward L. Beach, the commanding officer of USS Triton during Operation Sandblast. Also, the Naval Institute Press published Beneath the Waves by Dr. Edward F. Finch, a 2010 biography of the late Captain Beach, which included extensive coverage of Operation Sandblast. It is truly a cruise which tested the crew's mettle and proved the skipper's tenacity. More than that, however, it again proved to all who cared to listen that the US Navy could go anywhere, at anytime, and do what ever was required. It's a good sea story about doing what had to be done. On the fiftieth anniversary of the First Submerged Circumnavigation it's a good thing to do to re-read about one of the forerunners of all we've done since. ^ "In late February (1960) in the Atlantic, the USS Triton (SSN-586), shortly after departure for a submerged global circumnavigation, suffers a leak in a main condenser circulating water pump, necessitating the shutdown of the port reactor for five hours to effect repairs." Neptune Paper No. 3: Naval Accidents 1945 - 1988 by William M. Arkin and Joshua Handler, p. 27. ^ "03/01/60: In the beginning of March the USS Triton (SSN-586), while traveling down the Atlantic, springs a severe leak in its starboard propeller shaft due to loose bolts and an improperly installed water seal." Neptune Paper No. 3: Naval Accidents 1945 - 1988 by William M. Arkin and Joshua Handler, p. 27. ^ a b "The Modern Magellans". New York Times. May 13, 1960. Retrieved 12 March 2010. ^ Anderson, William R.; Don Keith (2008). The Ice Diaries: The Untold Story of the USS Nautilus and the Cold War's Most Daring Mission. Nashville, Tennessee: Thomas Nelson Publishers. pp. 154–159. ISBN 978-0-7852-2759-5. Retrieved 2010-02-18. ^ Beach. Around the World Submerged, p. 281. ^ a b Duncan, Rickover: The Struggle for Excellence, p. 167. ^ "Box 20: "Project Magellan"" (PDF). Evan P. Aurand Papers. Eisenhower Presidential Library. 1960. Retrieved 2010-03-02. ^ "Box 9: Medical Diary re DDE 1 January 1960 - 30 April 1960 (1)-(5) – "Pete Aurand and proposed submarine circumnavigation of globe"" (PDF). Howard McC. Snyder Papers. Eisenhower Presidential Library. 1960. Retrieved 2010-03-23. ^ Finch. Beneath the Waves, pp. 110, 230n29. ^ Finch. Beneath the Waves, pp. 110, 230n31. ^ Finch. Beneath the Waves, pp. 110–111. ^ a b c Polmar and Moore. Cold War Submarines, p. 67. ^ "Edward L Beach." Current Biography (1960), p. 21–22. ^ Beach. Around the World Submerged, p. 56–57. ^ a b Beach. Around the World Submerged, p. 16. ^ Friedman. U.S. Submarines since 1945, p. 97–98. ^ a b c Largess and Horwitz. "USS Triton: The Ultimate Submersible," p. 185. ^ Beach. Around the World Submerged, p. 40. ^ a b c First Submerged Circumnavigation 1960, p. B-5. ^ Beach. Around the World Submerged, pp. 40–42. ^ "Papers of Vice Admiral Wallace M. Beakley". Operational Archives Branch. Naval History & Heritage Command. 1940–1964. Retrieved 2010-03-09. ^ Beach. Around the World Submerged, p. 44. ^ a b c First Submerged Circumnavigation 1960, pp. B-5 to B-6, B-20. ^ a b c Beach. Around the World Submerged, pp. ix–x, Chapter 3, pp. 50–51. ^ a b Beach. Around the World Submerged, p. 50. ^ First Submerged Circumnavigation 1960, pp. B-5 to B-6. ^ Beach. Around the World Submerged, pp. 47–48, 56. ^ Beach. Around the World Submerged, p. 52–53. ^ Beach. Around the World Submerged, p. 51–52. ^ First Submerged Circumnavigation 1960, B-3. ^ Beach. Around the World Submerged, pp. ix–x, Chapter 3, pp. 44, 72. ^ a b Beach. Around the World Submerged, pp. 113 - 114. ^ a b Beach, Edward L. (November 1960). "Triton Follows Magellan's Wake". National Geographic. 118 (5): 587–589, 606–606. ^ Dempewolffe, Richard F. (February 1960). "This Makes the Torpedo Child's Play". Popular Mechanics. 113 (2): 248–250. Retrieved 2010-07-06. ^ Beach. Around the World Submerged, pp. 56–57. ^ First Submerged Circumnavigation 1960, p. B-79. ^ First Submerged Circumnavigation 1960, p. B-7. ^ First Submerged Circumnavigation 1960, pp. B-7 to B-9. ^ Beach. Around the World Submerged, pp. 84–87. ^ Beach. Around the World Submerged, pp. 89-92. ^ Weybrew. The ABC's of Stress. p. xii. ^ First Submerged Circumnavigation 1960, p. B-20. ^ First Submerged Circumnavigation 1960, p. B-21. ^ Beach. Around the World Submerged, pp. 93–95. ^ First Submerged Circumnavigation 1960, pp. B-9 to B-10. ^ Hadley, William (January 28, 2010). "Nuclear power's danger exaggerated". Letters to the editor. Yuma Sun. Archived from the original on 2010-04-17. Retrieved 2010-11-11. ^ First Submerged Circumnavigation, p. B-12. ^ Beach. Around the World Submerged, pp. 100–102. ^ First Submerged Circumnavigation 1960, pp. B-10 to B-12. ^ Beach. Around the World Submerged, pp. 94–96; 99–100. ^ First Submerged Circumnavigation 1960, pp. B-16 to B-17. ^ Beach. Around the World Submerged, pp. 102–112. ^ First Submerged Circumnavigation 1960, p. B-22. ^ Beach. Around the World Submerged, p. 128. ^ First Submerged Circumnavigation 1960, pp. B-22 to B-23. ^ a b Beach. Around the World Submerged, p. 116–140. ^ "ARGENTINA: The Ping in Golfo Nuevo". TIME. Time Inc. 22 February 1960. Retrieved 24 February 2010. ^ First Submerged Circumnavigation 1960, pp. B-24 to B-26. ^ First Submerged Circumnavigation 1960, p. B-2. ^ "Macon". Dictionary of American Naval Fighting Ships. Navy Department, Naval History and Heritage Command. Archived from the original on 2009-06-10. Retrieved 2010-02-24. ^ First Submerged Circumnavigation 1960, pp. B-24 to B-25. ^ Beach. Around the World Submerged, pp. 144-145. ^ "Dwight D. Eisenhower". Presidential Visits Abroad. U.S. Department of State. January 20, 1953 – January 20, 1961. Retrieved 2008-09-03. ^ First Submerged Circumnavigation 1960, pp. B-26 to B-30. ^ Beach. Around the World Submerged, pp. 142–158. ^ a b Beach. Around the World Submerged, p. 291. ^ Beach, Edward L. (November 1960). "Triton Follows Magellan's Wake". National Geographic. 118 (5): 593. ^ First Submerged Circumnavigation 1960, pp. B-30 to B-31. ^ Beach. Around the World Submerged, pp. 159–162. ^ First Submerged Circumnavigation 1960, pp. B-30 to B-31, B-33. ^ Beach. Around the World Submerged, p. 192. ^ First Submerged Circumnavigation 1960, pp. B-31 to B-33. ^ Beach. Around the World Submerged, p. 163–171. ^ Beach. Around the World Submerged, pp. 171–175. ^ a b Beach. Around the World Submerged, pp. 175–179. ^ First Submerged Circumnavigation 1960, p. B-33. ^ First Submerged Circumnavigation 1960, pp. B-33 to B-35. ^ Beach. Around the World Submerged, pp. 179–180. ^ Beach. Around the World Submerged, pp. 182–186. ^ First Submerged Circumnavigation 1960, pp. B-35 to B-36. ^ a b First Submerged Circumnavigation 1960, p. B-35. ^ a b Beach. Around the World Submerged, pp. 187–188. ^ First Submerged Circumnavigation 1960, p. B-37. ^ First Submerged Circumnavigation 1960, pp. B-39 to B-40. ^ Beach. Around the World Submerged, pp. 192–194. ^ First Submerged Circumnavigation 1960, pp. B-40 to B-B-43. ^ Beach. Around the World Submerged, pp. 195-201. ^ Beach. Around the World Submerged, pp. 201, 291. ^ Beach, Edward L. (November 1961). "Two Trips to Guam" (PDF). The American Legion Magazine. 71 (5): 20–21, 50. Retrieved 2018-01-20. ^ First Submerged Circumnavigation 1960, p. B-45. ^ Beach. Around the World Submerged, p. 205–206. ^ First Submerged Circumnavigation 1960, pp. B-45 to B-46. ^ Beach. Around the World Submerged, pp. 206–207. ^ First Submerged Circumnavigation 1960, pp. B-46 to B-49. ^ Beach. Around the World Submerged, pp. 205–217. ^ First Submerged Circumnavigation 1960, p. B-49. ^ a b "Mystery Man Who Eyed Triton Found". The Free Lance–Star: 6. November 6, 1960. Retrieved 2010-02-20. ^ a b "Scared Filipino Who Saw Triton Periscope Found". Tri-City Herald: 16. December 5, 1960. Retrieved 2010-02-20. ^ Beach, Edward L. (November 1960). "Triton Follows Magellan's Wake". National Geographic. 118 (5): 585–615. ^ Beach. Around the World Submerged, pp. 291–192. ^ First Submerged Circumnavigation 1960, pp. B-50 to B-57. ^ Beach. Around the World Submerged, pp. 217–221. ^ First Submerged Circumnavigation 1960, pp. B-57 to B-59. ^ Beach. Around the World Submerged, pp. 221–225. ^ First Submerged Circumnavigation 1960, pp. B-59 to B-60. ^ Beach. Around the World Submerged, pp. 225–227. ^ First Submerged Circumnavigation 1960, pp. B-60 to B-64. ^ Beach. Around the World Submerged, pp. 227–232. ^ First Submerged Circumnavigation 1960, pp. B-64 to B-68. ^ Beach. Around the World Submerged, pp. 233–244, 249–252. ^ Weybrew. The ABC's of Stress. pp. 88–89. ^ Weybrew. The ABC's of Stress. p. 89. ^ a b David Collins (April 16, 2010). "A 1960 submarine smoking ban lasted just three days". The Day. Retrieved 2010-04-17. ^ It took nearly another half-century for the Navy to ban smoking aboard subs. On 8 April 2010, the U.S. Navy announced a permanent smoking ban onboard submarines effective 31 December 2010. Lance M. Bacon (April 10, 2010). "SubFor: Smoking on subs to end by Dec. 31". Navy Times. Archived from the original on September 6, 2012. Retrieved 2010-05-21. ^ First Submerged Circumnavigation 1960, pp. B-68 to B-68. ^ Beach. Around the World Submerged, pp. 244-246. ^ Beach. Around the World Submerged, p. 247. ^ First Submerged Circumnavigation 1960, pp. B-60 to B-71. ^ Beach. Around the World Submerged, pp. 247–254. ^ a b First Submerged Circumnavigation 1960, pp. B-72 to B-73. ^ Beach. Around the World Submerged, pp. 254-257, 284. ^ Beach. Around the World Submerged, pp. 257–260. ^ a b c Beach. Around the World Submerged, pp. 263–267, 290. ^ First Submerged Circumnavigation 1960, pp. B-76 to B-79. ^ Beach. Around the World Submerged, p. 260–268. ^ Beach. Around the World Submerged, pp. 275, Epilogue. ^ Duncan. Rickover: The Struggle for Excellence, p. 168. ^ Duncan, Francis (2001). Rickover: The Struggle for Excellence. Annapolis: Naval Institute Press. p. 168. ISBN 978-1-55750-177-6. ^ "Box 10: Triton – First Submerged Circumnavigation Feb–May 1960, commemorative items, press information" (PDF). James C. Hagerty Papers. Eisenhower Presidential Library. 1960. Retrieved 2010-03-09. ^ "Triton". Dictionary of American Naval Fighting Ships. Navy Department, Naval History & Heritage Command. Retrieved 2010-02-24. ^ a b c Beach, Around the World Submerged, data sheet appendix. ^ Beach, Around the World Submerged, Administrative Remarks. ^ a b c d Tully, Clive (2002). Confronting Poseidon: Around the World Against the Odds. Portsmouth, England: Offshore Publishing. p. 15. ISBN 978-0-9544093-0-2. Retrieved 2010-05-21. ^ Twain Braden (Sep–Oct 1998). "New globe-girdling powerboat record". Ocean Navigator Online. Archived from the original on 2011-09-27. Retrieved 2009-04-20. ^ "Cable & Wireless Adventurer". SolarNavigator.net. 1991–2008. Retrieved 2010-05-21. ^ Confronting Poseidon, p. 16. ^ "Earthrace!". Popular Mechanics. Hearst Corporation. June 2007. Archived from the original on January 22, 2010. Retrieved January 6, 2010. ^ Beach. Around the World Submerged, p. 136. ^ Beach, Edward L. (November 1960). "Triton Follows Magellan's Wake". National Geographic. 118 (5): 594. ^ Beach. Around the World Submerged p. 291. ^ a b Beach. Around the World Submerged. ^ Richard Harris (6 May 2010). "Ship Logs Help Scientists Trace Oceans' Warming". VPR News. Vermont Public Radio. Retrieved 10 May 2010. ^ Richard Harris (6 May 2010). "Ship Logs Help Scientists Trace Oceans' Warming". National Public Radio. Retrieved 10 May 2010. ^ Beach, Edward L. (November 1960). "Triton Follows Magellan's Wake". National Geographic. 118 (5): 614–615. ^ "Submarine - Part 2". Psychological Officers. Molten Eagle. December 15, 2008. Retrieved 2009-01-20. ^ Mike Gruntman. Blazing the Trail: The Early History of Spacecraft and Rocketry. AIAA: 2004, p. 505. ^ Brooks, Courtney G.; James M. Grimwood; Loyd S. Swenson (1979). "Chapter 2.5: Astronavigation - The First Apollo Contract". Special Publication-4205: Chariots for Apollo: A History of Manned Lunar Spacecraft. NASA History Series. Retrieved 2010-03-01. ^ Paine, Lincoln P. (2000). Ships Of Discovery And Exploration. Boston, Massachusetts: Houghton Mifflin Harcourt. pp. 142–143. ISBN 978-0-39598-415-4. Retrieved 2014-01-03. ^ "12,005 Leagues Under The Sea". Time. 23 May 1960. Retrieved 2008-09-13. ^ ""New Magellan: Triton Circles World Submerged" narrated by Ed Herlihy". Universal Newsreel. 1960-05-12. Retrieved 2008-09-03. ^ Winkler, David F. (March 2009). "USS Triton Made History With Underwater Trip Around the World". Seapower. Washington, DC: Navy League of the United States: 50. Retrieved 2009-06-21. ^ "Beyond Magellan". seapower-digital.com. General Dynamics. 1960. Archived from the original on 2011-07-26. Retrieved 2010-09-09. ^ "Beyond Magellan". Stories of Submariners & Their Boats. General Dynamics. 1960. Retrieved 2010-09-09. ^ "We Circled the Globe Submerged - Saturday Evening Post, October 22, 1960" (PDF). Box 20, Beach Papers. Eisenhower Presidential Library. 1960. Archived from the original (PDF) on July 21, 2011. Retrieved 2010-03-02. ^ Finch. Beneath the Waves, p. 130. ^ "TV Listings". Time. February 17, 1961. Retrieved 2008-09-03. ^ "The Saga of the Triton". Periscope Films. YouTube. 1961. Retrieved 2014-01-18. ^ First Submerged Circumnavigation 1960. ^ Beach, Edward L. (1960). Current Biography Yearbook. H. W. Wilson Company. p. 22. ISBN 978-0-8242-0478-5. ^ a b Finch. Beneath the Waves, p. 131. ^ Dibner, Bern (1964). Victoria and Triton. New York: Blaisdell Publishing Company. ISBN 978-0-486-21734-5. ^ Copyright Office (1961). Catalog of Copyright Entries. Third Series: 1961: July–December. Library of Congress. Retrieved 2010-05-26. ^ Grun, Bernard (1975). The Timestables of History (Paperback)|format= requires |url= (help) (3rd ed.). New York City: Simon & Schuster. p. 547. ISBN 978-0-671-74271-3. ^ Chaplin, Joyce E. (2012). Around About the Earth: Circumnavigation from Magellan to Orbit (Hardcover)|format= requires |url= (help). New York City: Simon & Schuster. pp. 353–355, 495. ISBN 978-1-416-59619-6. In this first full history of around-the-world travel, Joyce E. Chaplin brilliantly tells the story of circumnavigation. Round About the Earth is a witty, erudite, and colorful account of the outrageous ambitions that have inspired men and women to circle the entire planet. ^ a b Carl LaVO (June 2010). "Incredible Voyage". Naval History. United States Naval Institute. 24 (3): 50–57. ISSN 1042-1920. ^ a b John Beach (April 2010). "USS TRITON (SSRN-586): The First Submerged Circumnavigation". The Submarine Review. Naval Submarine League: 23–35. Archived from the original on 2010-07-22. ^ a b Finch. Beneath the Waves, p. 207. ^ a b Finch, Edward F. (2010). Beneath the Waves: The Life and Navy of Capt. Edward L. Beach, Jr. Annapolis, Maryland: Naval Institute Prress. ISBN 978-1-591-14266-9. ^ "Run Silent, Run Deep: An Interview with Captain Edward L. Beach" (PDF). All Hands. U.S. Navy. August 1999. Archived from the original (PDF) on 2006-04-16. Retrieved 2011-02-25. ^ Beach. Around the World Submerged, pp. vii, 10, 284. ^ a b Cunningham, Jim (May 11, 1960). "2,000 Welcome Sub Triton On return Voyage". The Day. New London: The Day Publishing. p. 2. Retrieved 2010-03-12. ^ Beach. Around the World Submerged, pp. 270, 284. ^ "Presidential Unit Citation". USS Nautilus. Submarine Force Library and Museum. 1958. Retrieved 2010-03-21. ^ "Nautilus". Dictionary of American Naval Fighting Ships. Navy Department, Naval History and Heritage Command. Retrieved 2010-03-21. ^ "Citation accompanying Award of Legion of Merit to Captain Edward L. Beach, USN, dated May 10th, 1960". Public Papers of President Dwight D. Eisenhower, 1960-1961. The American Presidency Project [online]. Retrieved 2008-09-28. ^ "Magellan of the Deep". Argosy. August 1960. Retrieved 2008-09-03. 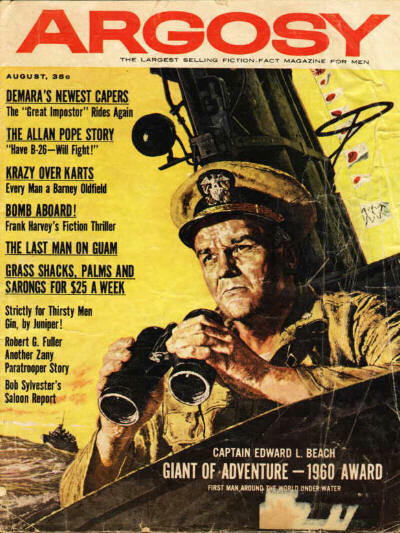 ^ ""Giant of Adventure: Captain Edward L. Beach" - Argosy, August 1960" (PDF). Box 20, Beach Papers. Eisenhower Presidential Library. 1960. Archived from the original (PDF) on 2011-07-21. Retrieved 2010-03-02. ^ "Kudo". Time. 13 June 1960. Retrieved 2008-09-13. ^ "The Magellanic Premium". Prizes. American Philosophical Society. Retrieved 2008-09-13. ^ "Technology for the Nuclear Age: Nuclear Propulsion". Cold War Gallery. U.S. Navy Museum. 2011. Retrieved 2011-10-12. ^ a b First Submerged Circumnavigation 1960, B-76. ^ Dibner. Victoria and Triton. p. 47. ^ a b c Beach. Around the World Submerged, pp. 55–56, 290. ^ "Triton Light Pictures". Historical Marker Database. Retrieved 2008-09-13. ^ Cutler, USN (ret. ), Thomas J. (August 2006). "History Repeats Itself". United States Naval Institute Proceedings. 132 (8). ^ Peter, Gordon (July 1999). "Pen and Sword". Seapower. ^ Turner, Jack (July 2005). "USS Albacore (AGSS-569) and the Submarine Hall of Fame". Newsletter #51. USS Spinax (SSR/SS-489) Organization. Archived from the original on April 17, 2009. Retrieved 2008-09-16. ^ "Triton Sail" (PDF). The re: Port of Benton. Port of Benton. Fall 2009. Archived from the original (PDF) on 2010-02-22. Retrieved 2010-02-11. ^ "Nuclear Sub Coming to New Richland Park". Evening News. KNDO/KNDU. 2008-02-21. Retrieved 2010-03-09. ^ "Meeting Minutes". Board of Commissioners. Port of Benton. 2008-03-28. Archived from the original on 2008-06-12. Retrieved 2008-09-13. ^ "Historic submarine sail arrives at Richland park". Mid-Columbia News. Tri-City Herald. 2009-10-22. Archived from the original on 2012-08-26. Retrieved 2009-10-22. ^ "Inside Triton's Conning Tower" (PDF). Submarine Photo Archive. NavSource.org. 2009-03-08. Retrieved 2009-03-08. ^ "Nuclear submarine sail lands a permanent dock in Richland". Tri-Cities Area Journal of Business. TriComp Inc. December 15, 2009. Archived from the original on August 26, 2012. Retrieved 2010-03-22. ^ "Commission Meeting Minutes". Port of Benton. August 11, 2010. Archived from the original on June 12, 2008. Retrieved 2010-09-23. ^ "Richland Riverfront Trail". Rails-to-Trails Conservancy. 2011. Retrieved 2011-04-08. ^ Bryant Maddrick (September 29, 2011). "Submarine park almost ready for debut". KNDO. Retrieved 2011-09-06. ^ Colliver, Tom (1991). "Seaview: The Making of Voyage to the Bottom of the Sea". Seaview Soundings (3). ^ "Around the World under the Sea". Movie Database: Full Synopsis. Turner Classic Movies. 2010. Retrieved 2010-03-13. ^ "Voyage to the Bottom of the Sea". Movie Database: Full Synopsis. Turner Classic Movies. 2010. Retrieved 2010-03-13. ^ Neal Conan (September 20, 2006). "Bob Newhart, 'I Shouldn't Even Be Doing This'". Talk of the Nation. National Public Radio. Retrieved 2010-05-12. ^ Finch. Beneath the Waves, p. 132. ^ "Stamps: Antigua & Barbuda". Index by Country. SubmarinesOnStamps.co.il. Retrieved 2009-04-20. ^ William Kenny (May 11, 2010). "Past meets the future: USS Triton (SSRN 586) shipmates visit SUBSCOL". The Dolphin. Naval Submarine Base New London. Retrieved 2010-03-10. ^ a b Jennifer Grogan (April 10, 2010). "Submarine Force to honor Triton's historic voyage". The Day. Retrieved 2010-04-10. ^ T. H. Merritt (April 15, 2010). "110th Submarine Birthday Ball:A celebration of past and present". The Dolphin. Naval Submarine Base New London. Retrieved 2010-04-21. ^ "MCPON Rick West Attends 110th Submarine Birthday Ball". Commander, Submarines Forces. April 10, 2010. Archived from the original on October 8, 2013. Retrieved 2010-04-23. ^ "9,000 Leagues under the Sea" (PDF). April Break Flyer. Submarine Force Library and Museum. 2010. Retrieved 2010-03-22. ^ "Upcoming Events". Submarine Force Library and Museum. April 2010. Retrieved 21 April 2009. ^ "SFLM celebrates USS Triton's circumnavigation". The Dolphin. April 22, 2010. Retrieved 2010-06-13. ^ Randi Klien (April 2009). "Dolphin Scholarship's Race Around the World". The Submarine Review. Naval Submarine League: 126. Archived from the original on 2010-07-22. ^ "Race Around the World". Events. Dolphin Scholarship Foundation. 2010. Retrieved 2010-06-12. ^ "Minnesota man joins celebration of historic military event". WDAY-TV. May 3, 2010. Archived from the original on August 26, 2012. Retrieved 2010-05-27. ^ Damond Benningfield (5 April 2010). "USS Triton". Science and the Sea. The University of Texas Marine Science Institute. Retrieved 2014-01-04. ^ James C. Hay (April 2010). "Editor's Comments". The Submarine Review. Naval Submarine League: 2. Archived from the original on 2010-07-22. Arkin, William M.; Handler, Joshua (June 1989). Neptune Paper No. 3: Naval Accidents 1945 - 1988 (PDF). Washington, DC: Greenpeace/Institute for Policy Studies. Beach, Edward L. (1962). Around the World Submerged: The Voyage of the Triton (Paperback) (First ed.). New York: Holt, Rinehart and Winston. ISBN 978-1-55750-215-5. LCC 62-18406. Chaplin, Joyce E. (2012). Around About the Earth: Circumnavigation from Magellan to Orbit (Hardcover). New York City: Simon & Schuster. ISBN 978-1-416-59619-6. Retrieved 2013-03-02. Dibner, Bern (1964). Victoria and the Triton. New York: Blaisdell Publishing Company. ISBN 978-0-486-21734-5. Duncan, Francis (2001). Rickover: The Struggle for Excellence. Annapolis: Naval Institute Press. ISBN 978-1-55750-177-6. "Edward L. Beach Papers" (PDF). Dwight D. Eisenhower Presidential Library and Museum. 1953–1961. Archived from the original (PDF) on 2011-07-21. Finch, Edward F. (2010). Beneath the Waves: The Life and Navy of Capt. Edward L. Beach, Jr. Annapolis: Naval Institute Press. ISBN 978-1591142669. Friedman, Norman (1994). U.S. Submarines since 1945: An Illustrated Design History. Annapolis: Naval Institute Press. ISBN 978-1-55750-260-5. Largess, Robert P.; Horwitz, Harvey S. (1993). "USS Triton: The Ultimate Submersible". In Gardiner, Robert. Warship 1993. London: Conway Maritime Press. pp. 167–187. ISBN 978-0-85177-624-8. OCLC 30209229. Polmar, Norman & Moore, J.K. (2004). Cold War Submarines: The Design and Construction of U.S. and Soviet Submarines (Paperback). Washington, DC: Potomac Books, Inc. ISBN 978-1-57488-530-9. USS Triton SSRN-586: First Submerged Circumnavigation 1960. Washington, DC: US Government Printing Office. 1960. O–550280. Weybrew, Benjamin B. (1992). The ABC's of Stress: A Submarine Psychologist's Perspective. Westport: Praeger Publishers. ISBN 978-0-275-94233-5. Wikimedia Commons has media related to Operation Sandblast. This page was last edited on 27 March 2019, at 22:28 (UTC).